The TR002Y-1 Steam Generator and integrated electronics for replacement on showers with the same model code. This part is compatible with Electronic control pads also featuring the same TR002Y-1 code. 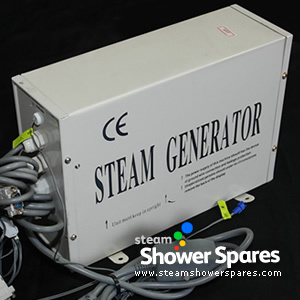 The steam generator is rated up to 3kW and is for UK use only. It comes with a power lead fitted with an RCD. The unit has numerous cable/leads from it to connect to Lights, Fan, Speaker, Control pad, Ozone etc. There may be other models also. Unit colour may vary from that shown here. All Copy and Images on this website are Copyright Steam Shower Spares © 2015. All rights reserved.